About how many crackers can I expect to get per case? Each individually-wrapped package contains 6 crackers. Each case consists of 120 wrapped packages, for a total of 720 crackers. When you pack rich vanilla creme inside two vanilla cookie wafers, the layers of flavors combine to create one irresistible cookie sandwich! 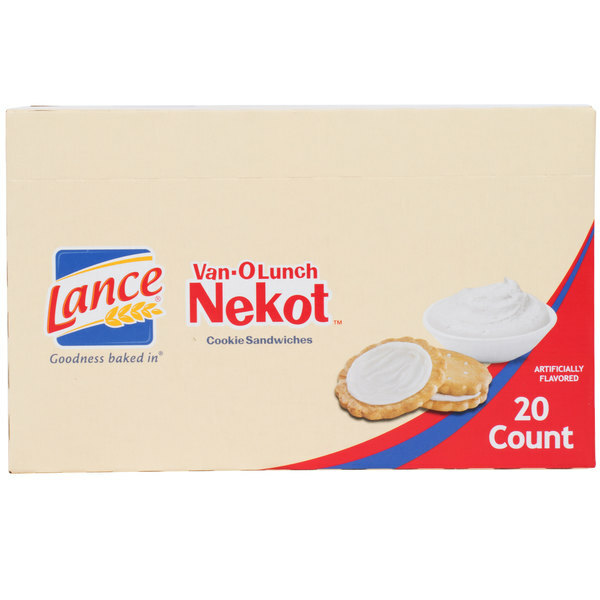 Lance Van-O-Lunch Nekot vanilla creme sandwich cookies make the perfect sweet snack to keep hunger at bay. Plus, your customers are sure to recognize a name like Lance when selecting their next snack. Lance has provided satisfying snacks made with wholesome ingredients for over 100 years, offering classic and innovative snack varieties. For snacks of superior quality and timeless taste, offer Lance sandwich crackers at your restaurant, concession stand, extended stay facilities, or event! Made with rich vanilla creme between two crispy, vanilla cookies, these Lance sandwich cookies contain 2 grams of protein. Compared to other sweet snacks, they have no preservatives and no trans fat per serving. They are individually-packaged with 6 crackers per package to control portioning and present a clean and sanitary appearance. Serve these sandwich cookie packs in baskets at your party or sell them at your convenience store or vending machine, and they're a quick and easy way to satisfy any customer's cravings for something sweet! Delicious vanilla wafers filled with yummy vanilla creme makes for a perfect sweet treat any time of the day. These little portion packs make them perfect for vending machines, convenience stores, gift shops, concession stands -- almost anywhere snacks are found. 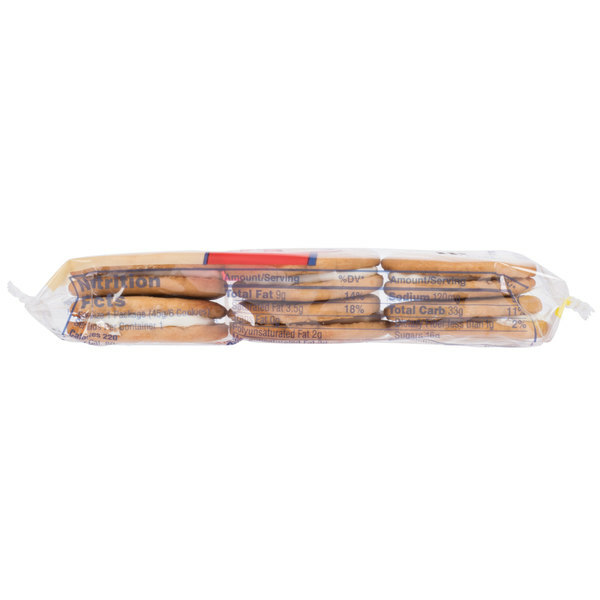 These vanilla crackers are just so delicious to keep around for snacks and break time. If you have a vending machine, they are great sellers. A great sweet style sandwich cookie from Lance that has a great flavor. The van-o-lunch nekot cookies are well packaged ensuring freshness on every pack. These great tasting Vanilla Creme Sandwich Cookies are perfect for lunches and snacking. 6 cracker sandwiches per package and 120 packs in a case makes them very affordable. 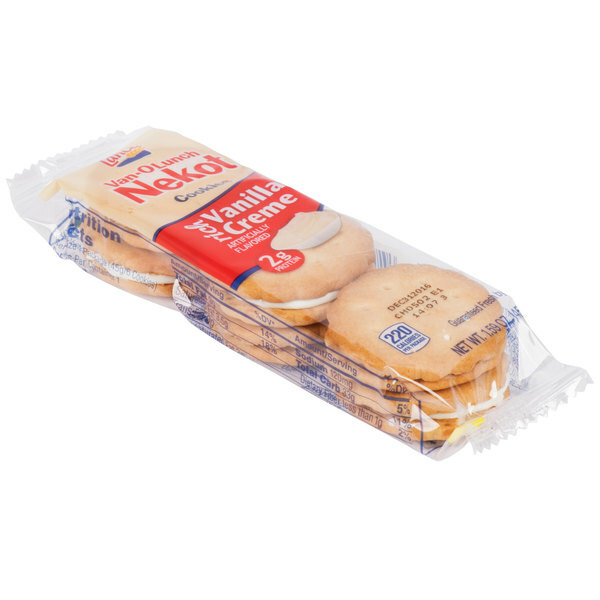 The nekot vanilla crème sandwich cookies are great and taste wonderful. The cookies are a sweet treat for our kids lunches and the quality is unbeatable. Great tasting crackers for the price. Each cracker sandwich is filled with rich vanilla cream making these a great snack. Full case of 120 packages is a great value. These cracker sandwich packets are a great value. Each case includes 120 packets with 6 crackers each. These are great tasting crackers filled with vanilla cream. 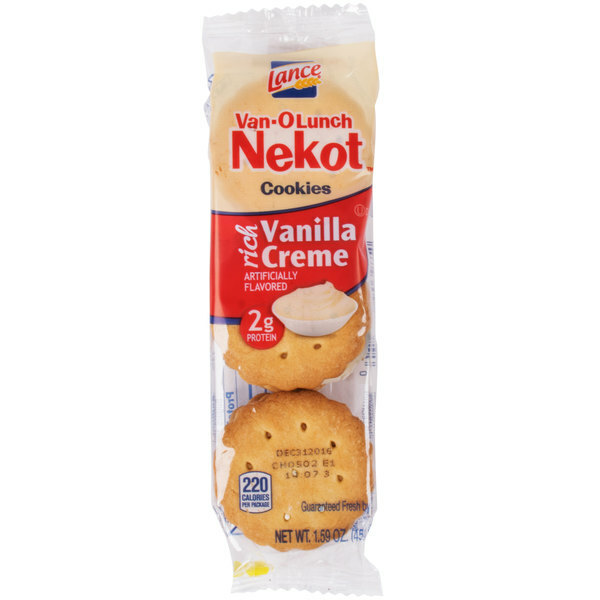 The lance van-o-lunch nekot vanilla crème sandwich cookies are so yummy. They make a wonderful snack and great for our break room. They are a wonderful price! Wonderful vanilla flavor lance crème cookies. Always fresh and is one of many cookie and cracker we offer from Lance. Webstaurant does a great job shipping, Ive yet to have a broken pack. Like many of Lance's crackers/cookies, these are a tasty treat. Nice and sweet with a good amount of vanilla flavor. Perfect for a mid-afternoon snack or after dinner treat. Good to keep in your car or at work too...in case of needing a quick bite. These are wonderfully packaged, and tasty vanilla cookies. The vanilla flavor is not overpowering, but makes an impact. The cookies are fresh and crunchy. Great value. A nice delicate flavor and a good crunch to these Vanilla crème sandwich cookies. There isn't another cookie on the market that holds up like these do. I have tried all of the Lance brand cookies and crackers in packs like this and this one is my favorite. These are absolutely delicious with a glass of milk. Kids love them too.